The concept of Aegina yacht services is straightforward. Whether it is maintenance, or a large repair job. Aegina Yacht Service is where you will find what you need. Your one - stop - shop for all your yachting needs! GRP repairs, paint systems, carpentry, electronics, delivery services & boat yard. 01 Fiberglass-, Gel Coat repairs, Epoxy- and Paints Systems. 02 Engine maintenance (Perkins, Volvo, Yanmar, etc). General electric repairs, electric pumps( ITT, Jabsco, etc.) Anchor winches, Alternators, Starter motors, Batteries, Plumbing repairs and installations. 03 Rigging, Deck fittings, Winches and Sail services. 04 Wood Works and Teak Decks. 05 Antifouling systems as International, Hempels and others. 06 Osmosis Heat Treatments off FiberGlass Hulls(Reversed Hydrolysis). HotVac and HYAB system. 07 General Yacht Maintenance, also Life-Raft- and Fire extinguisher surveys. 08 Yacht Guardianage for when you are not in this area. 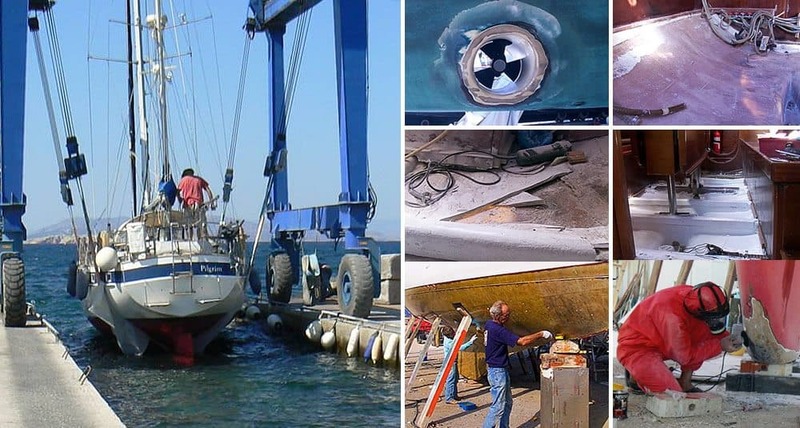 The work domains of Aegina yacht services are: The port of Aegina Town and the three local boatyards on the Island's North Coast. See the pictures below of the lifting equipment of the different yards.